So Domo was in NYC last week while Aaron was at an SEO conference and I tagged along. 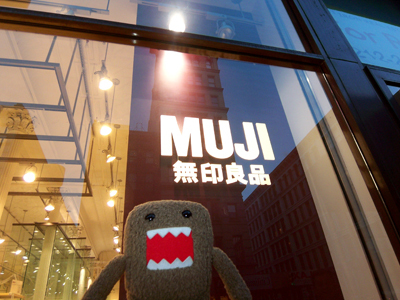 Domo liked Rice to Riches. 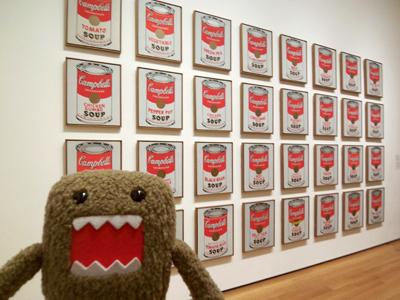 Check out what else Domo liked in NYC. Domo better like an expanding waistline! I suppose if he was Godzilla-size he'd eat New York. Lucky for them he's content with burgers and rice thingies. Wow, what hotel was that? Like Domo, I'd like staying there too. It looked like someone's cool apartment. Mmmm Max Brenners. Mmmmmm. Rice to Riches is a new one to me and makes me wonder what other kind of specialty stores might pop up in NYC. The pudding store? The Pie shop? I really can't think of anything better than a store full of rice pudding. Yum! Warhol...cool! I'm watching Factory Girl tonight. I hope it's good. Your Domo has stubby legs and long arms. My Domo had the opposite. What's up with that?? Isn't Rice to Riches yummy? Where did you stay? It looks really cool and spacious for a NYC hotel room. deodand - that is weird! I ordered our Domo from the Domo website. Where did you get yours? I saw some at Urban Outfitters. Amy - we loved the rice pudding. We were staying at the AKA hotel.